Enjoy the Complete Tasty Salad Experience Now! • TOP QUALITY - It is strictly made from the world's finest natural imported and domestic ingredients which are very tasty and healthy. This is the top notch brand made in the USA with a longer time expiry date. • FULLY HEALTHY- There's nothing you can ask for more with all this healthy benefits; Calorie free, Sugar free, Carb free, Fat free, cholesterol free, Gluten free, & Dairy free. It's perfectly made for a healthy lifestyle. • VARIETY of FLAVORS - Choose your favorite dressing from this delicious 5 different flavors, which are; Ranch, Italian, Creamy Bacon, Thousand Island, and Honey Dijon. Each dressing has two of 1 Oz packets for every flavor which is perfect for couples. • SAFE & LIGHTWEIGHT - A kosher certified, vegan, no MSG and artificial sweeteners. It comes with a small packet foil which you can easily fit in your pocket, wallet, purse, pouch or bag and more. Bring it everywhere you go. 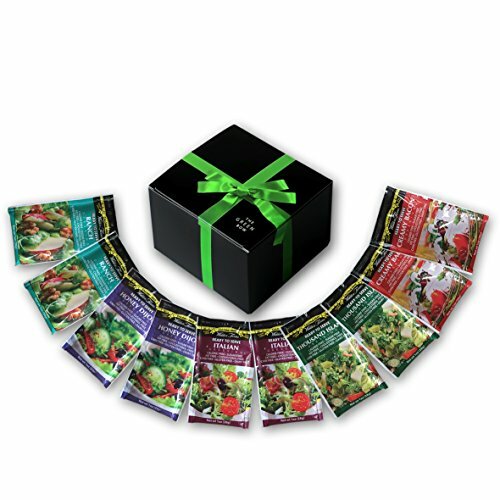 • PERFECT GIFT - It comes with a cute black box with green ribbon tie which keeps the packets organized. An excellent gift for your parents, friends, couples, love one's or to everyone who loves to eat salad dressing without gaining weight.